StarBound Observer's Chairs. Illustration courtesy of StarBound. Standing up half the night gets tiring and bending over to look through a telescope eyepiece for an extended time is hard on the back, not to mention not being very steady. Often overlooked by observers who do not have an observing chair is the point that a chair makes the observer steadier, making it easier to focus on the view through a telescope and to see faint objects. In some situations, a good chair is probably worth a couple inches of clear aperture. A portable observing chair or stool makes observing more enjoyable and will be much appreciated when you are out telescoping. 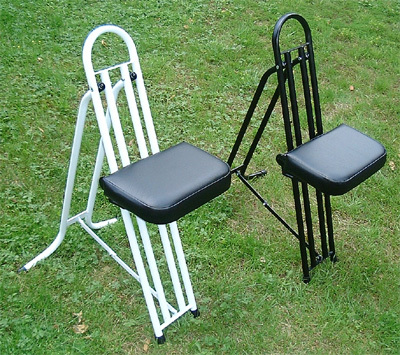 Folding, three-leg campstools are very economical and can be had in most sporting goods stores. They are not optimum, but they are better than nothing. A much better solution is the Star Bound Observer's Chair that is the subject of this review. This is a well-made, formed and welded tubular steel frame, four-leg viewing chair designed expressly for use with a telescope. It has more seat height adjustment range than the round observing stools I have seen (Tele Vue, Orion, etc.). All StarBound hardware is stainless steel. Its foam-padded seat is easily adjustable in height from nine to 32 inches and the four-tube steel frame serves as a surprisingly comfortable backrest. The back legs form widely spread feet that give the chair a secure stance. The adjustable height seat is thickly padded and covered with a durable black vinyl material. Should the seat cover be damaged in some way, it is easily recovered. The seat is attached to the frame by means of two semi-square steel projections extending several inches rearward from each side below the seat. There are matching holes drilled in these seat frame projections and the ends of a thick, steel support bar. The holes in the support bar are tapped to accept large machine bolts that hold the bar in place between the seat projections. These bolts are provided with big, easy to grip, plastic knobs, so that no tools are required to attach and remove the seat. With the seat removed the steel chair frame folds flat for transporting or storage and is easy to carry. Assembled for use, the seat rides in front of the chair frame and the support bar is bolted to the seat extensions behind the frame, trapping the frame between the back edge of the seat and the support bar. In use, the seat can be manually raised and lowered to any position on the chair frame with little effort. The chair's frame, which slants rearward at a comfortable angle, serves as the seat's guide rails. Friction holds the seat at whatever height it is set and the observer's weight locks it in place. It is hard to describe how the seat works, but the concept is simple and easily understood once seen. Available frame colors are white and black. Black probably wouldn't show minor scratches, nicks and dirt as much as white, but the white frame is easier to spot in the dark, so I ordered my StarBound chair in white. I have stumbled over enough dark colored junk in the dark, thank you. Seat height adjustment range: 9" to 32"
Shipping dimensions: 42" x 23" x 5"
The wide range of seat adjustment heights makes the StarBound chair a good complement to the great majority of portable telescopes. It goes low enough to accommodate viewing through a refractor pointed at the zenith and high enough for most small to medium size Newtonians. No commercial CAT or Cassegrain should present a problem. Only a large Newtonian pointed straight up is liable to put its eyepiece beyond the adjustment height range of an observer on a StarBound chair. Because the StarBound chair's seat height it is easily adjustable, the observer can keep his or her head at the optimum height for comfortable observing as the telescope changes attitude, which is impossible with fixed height stools. At its lowest setting, the chair becomes unbalanced with an observer in place and tends to tip forward. However, this is not much of a problem, as you are then only inches off the ground, anyway. I used a wide-tip black marker to draw rings around my chair's frame to indicate the lowest and highest seat heights that felt comfortable to me. These show up well against the white frame, even at night, and indicate my personal chair's "never exceed" seat adjustments. The StarBound chair is made entirely in the USA of top quality materials and should last for decades. It is available from most online telescope retailers, including Optics Planet, OPT, Woodland Hills and Orion. Do not be fooled by lower priced Asian copies. Most of these lack sufficient rigidity and friction to keep the seat from sliding down the frame rails during use and should be avoided. The StarBound is a good viewing chair, the best of its kind on the market. Unfortunately, it is not particularly inexpensive. On the other hand, the price is more than reasonable for the comfort it provides and its inherent durability. It took me a good many years to decide to order mine, but I've been using it for two years now and I am glad that I did. Copyright 2010 by Chuck Hawks. All rights reserved.